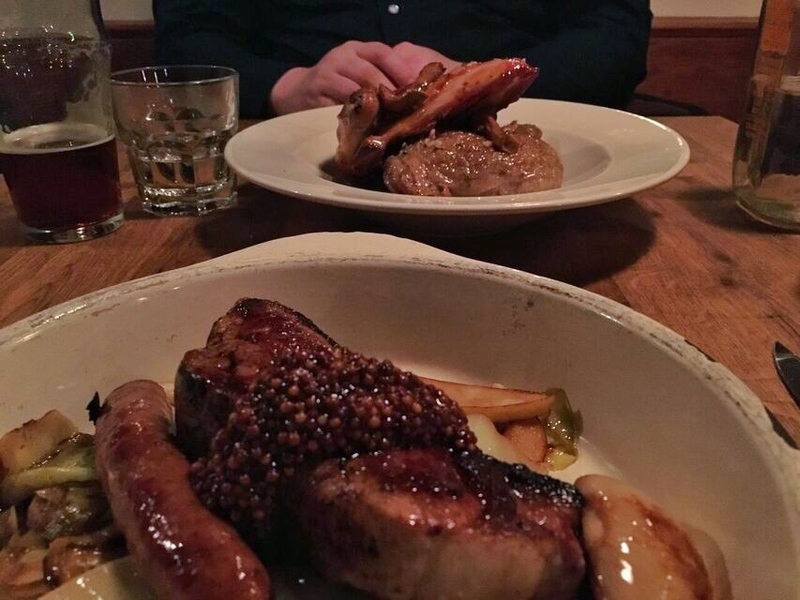 Kicking off Portland Dining Month with a meal at Old Salt Marketplace, courtesy of Travel Portland. Find out what this little neighborhood eatery has to offer you. Tell me if you have experienced this phenomenon. I call it “Portland Small Talk”. In the same way many people turn to television as a conversation starter (“What are you watching right now?”) many Portland folks are turning to restaurants for a conversation starter. “Been to any good restaurants recently?” It was how I managed to have a very lively 20 minutes conversation with relative strangers the other day. Maybe it’s just the people I seem to meet, but restaurants continue to be what everyone is obsessed with. Myself included. 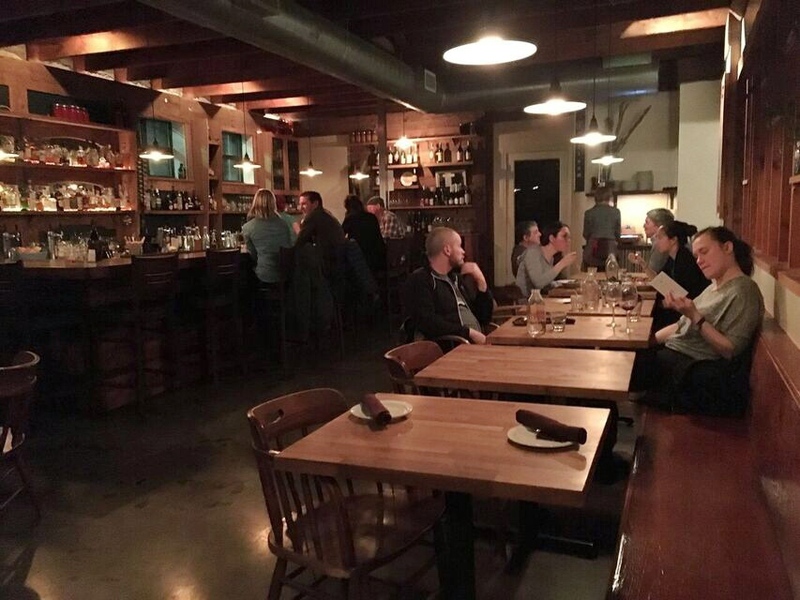 The good news is that this month, March, is Portland Dining Month. More than 120 restaurants are joining up to offer special 3-course menus for $29. In my experience this CAN be a great deal, but not always, it all depends on the restaurant. I usually check out one or two restaurants during the month. Honestly, a $60+ meal for my husband and I (plus drinks and tips) is still kind of a splurge so we pick our menus carefully. 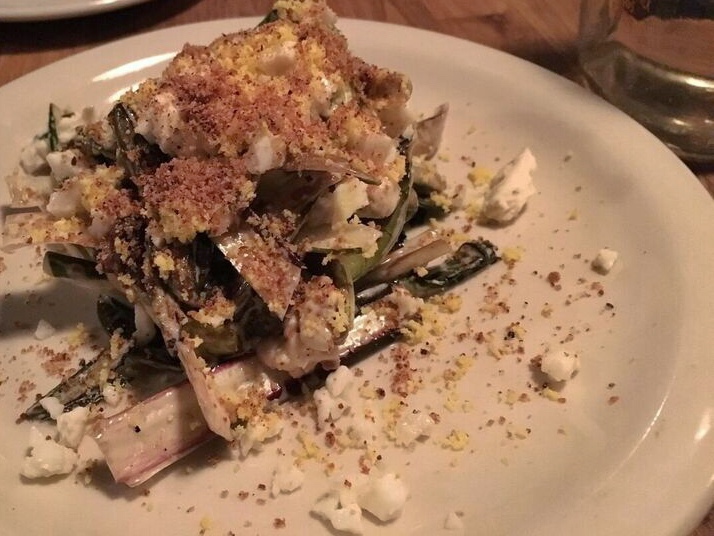 You can check out the menus from all 120 restaurants on the Portland Dining Month website. 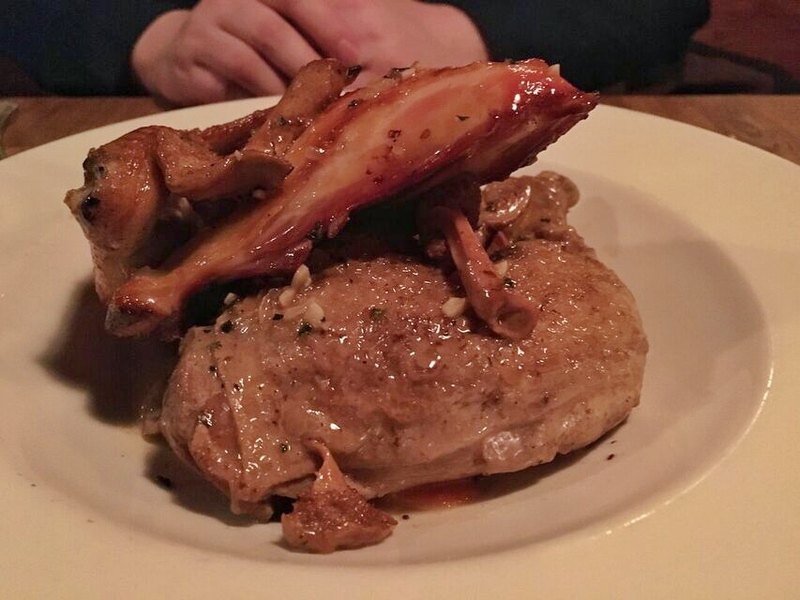 This year we had a fantastic dinner at Old Salt Marketplace, courtesy of Travel Portland. This is a fantastic little neighborhood restaurant we’ve been wanting to check out for a while because it’s just 5 minutes from our house. The menu is very meat focused and they even have a butcher counter that is open during the day. 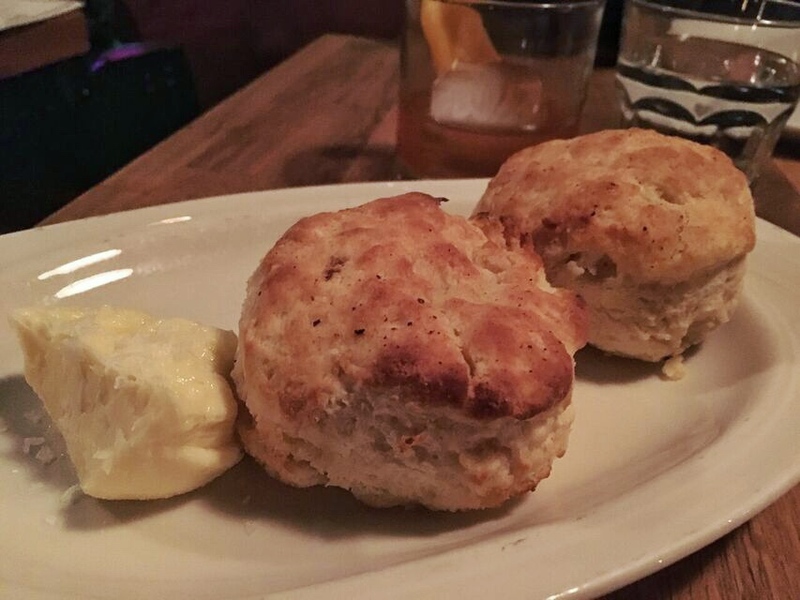 We always share our meals, so we ordered the Portland Dining Month special, plus some biscuits and the pork chop entree. The first course was fresh oysters, grilled on a hearth. I’m really not much of a seafood eater but I loved these… and you know why? Because they were cooked a little! 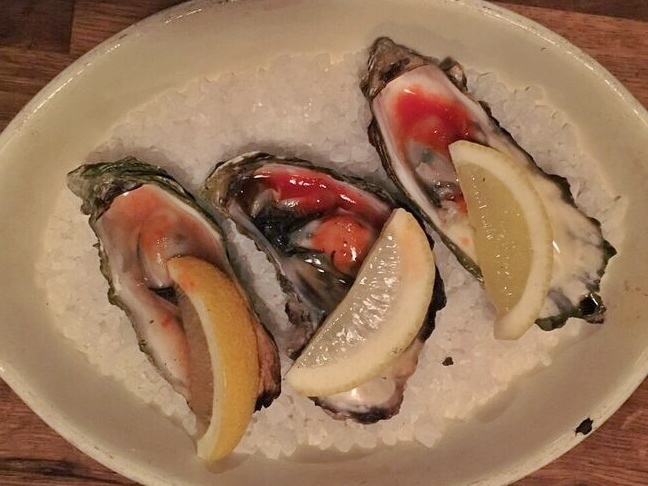 I think raw is the only way I’ve ever had oysters prepared, so these were a very pleasant surprise. Second course is a grilled chicories salad. It was a little overdressed for our liking but I enjoyed trying chicories, a green I’ve never eaten before, and the little bacon chunks were pretty yummy. The final course was chicken braised in beer from Upright Brewing. It was delicious, moist and flavorful, exactly what you want from chicken. But my favorite was the pork chop dish. Of course, I’ve always preferred pork to chicken so I may not be the best judge. 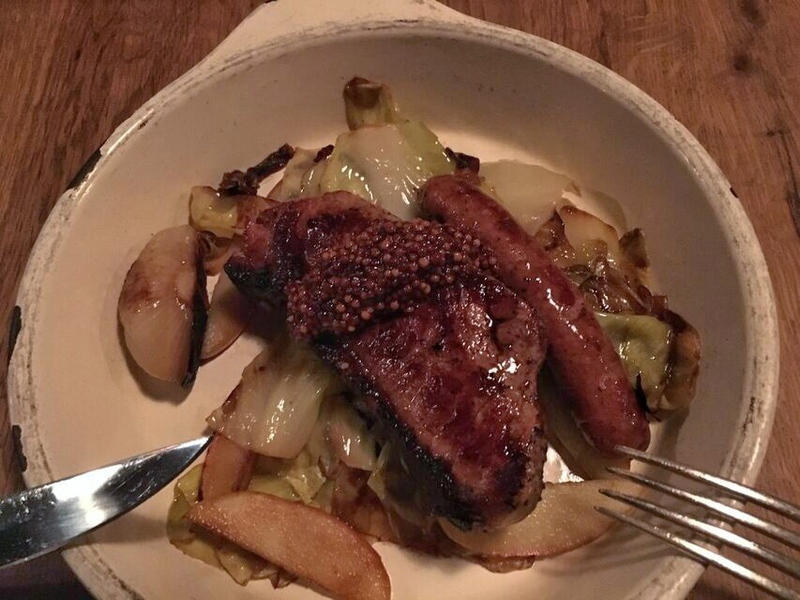 It was served with a pile of braised cabbage and apple with a house-made sausage. So good. Overall we really liked this place. I could see us coming back again if we need someplace nice to eat that’s close to the house. This neighborhood is becoming a bit of a food hotspot with Pizza Jerk (8/16 update: Pizza jerk burned down.) across the street and NEPO42 and Pollo Norte down the street. My only complaint: the food was a touch too salty. But what do I expect from a place called Old Salt? Happy Dining Month everyone! I’d love to hear which restaurants you plan to check out.